A near faultless performance from Alinghi saw it move top of the Extreme Sailing Series™ Los Cabos leaderboard as the double-points season finale reached the halfway mark. 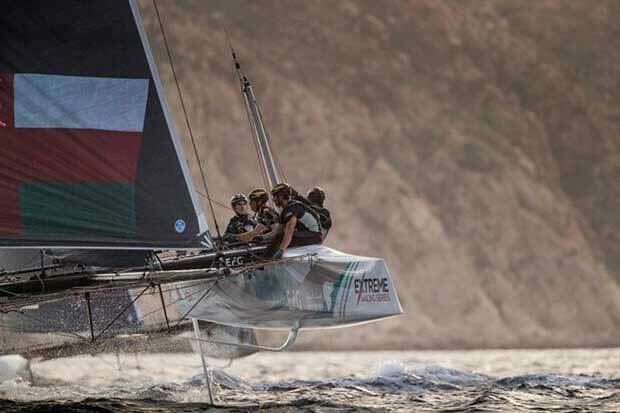 Meanwhile, SAP Extreme Sailing Team upheld its spot on the podium behind Oman Air and continued to defend its overall grip on the 2017 rankings. Five wins from six races gave Alinghi a six-point overnight lead. Only Oman Air was capable of spoiling its whitewash in the final leg of the closing race. “We were very fast on the racecourse and we had a little bit of luck with the wind shifts. We had some clear starts and everything came together,” said Arnaud Psarofaghis, co-skipper and helm of the Swiss entry. “The team worked well on the water and we had a near-perfect day, just one second place in the last race, and it was great. We’ll have one or two beers this evening after a good day’s racing,” he added. 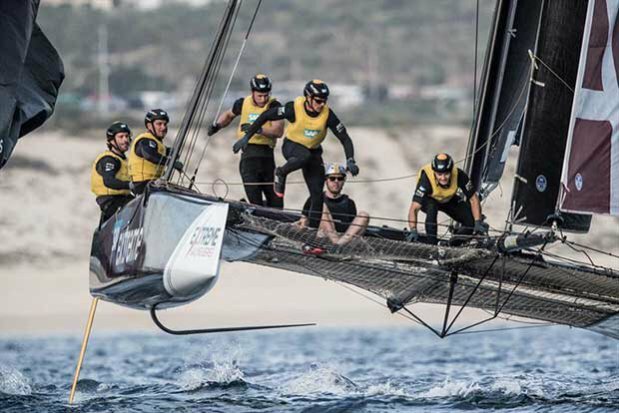 Despite Alinghi and Oman Air’s best efforts to stay ahead of the pack in Los Cabos, in order to topple SAP Extreme Sailing Team’s overall reign of glory they require the help of a third team to knock the Danes off the Act podium. Something that is proving difficult. “We’re very happy today, things went better for us,” said Adam Minoprio, helm of SAP Extreme Sailing Team. “Oman Air had a very lucky day on the first day, smashed it, and got great results and then Alinghi again today. “Over the last two days they have both been very deep in a lot of races and managed to come back to get first or second. We feel like we started well, sailed well and got to the first mark in good positions. We just need to iron out the little problems. We’ll have our day before the regatta is out and we’ll get the lead,” Minoprio added. 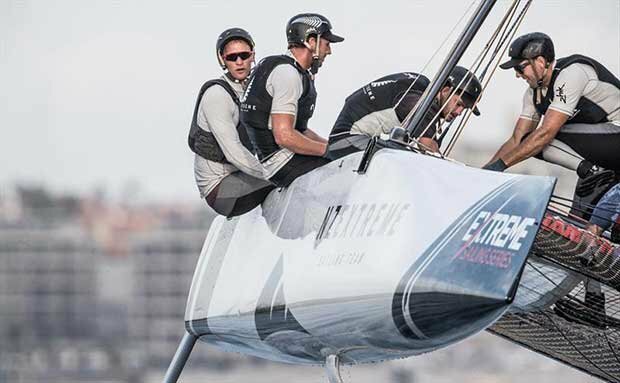 Although 14 points separate Red Bull Sailing Team from SAP Extreme Sailing Team in third, the Austrian squad managed three podium finishes and climbed from sixth to fourth. If Red Bull Sailing Team can continue this trend it could threaten the podium and the overall season result. “Today was a bit mixed. It was better than yesterday but we’re still not on the top of our game. We can do better but it’s a very tricky venue. If you make one little mistake it’s hard to catch up again,” said skipper and double Olympic gold-medallist Roman Hagara. Emirates Team New Zealand America’s Cup champion Josh Junior was able to keep NZ Extreme Sailing Team ahead of Land Rover BAR Academy, which is helmed by his British America’s Cup rival and Olympic gold-medallist Giles Scott. “It would be very nice if we got a podium but I don’t think after today we’re quite there yet,” said Kiwi co-skipper Junior. “We’re fighting in amongst it, getting closer day by day, and maybe tomorrow we’ll work our way into it. NZ Extreme Sailing Team and Land Rover BAR Academy occupy fifth and sixth respectively. Local wildcard Team Extreme México managed to retain a three-point buffer over US-flagged wildcard Lupe Tortilla Demetrio to finish seventh. The penultimate day of the Act kicks off at 14:00 UTC-7 tomorrow, Saturday 2 December. The free-to-enter public Race Village, located on Médano Beach, is open from 10:00 local time. More information about the event, and the VIP packages that are available, can be found on the official event page. Fans can follow the racing remotely via the live stream on the official Facebook and YouTube from 14:00 – 17:00 UTC-7 on Saturday 2 and Sunday 3 December. The final 90 minutes of racing on Sunday will be broadcast live on TV channels across the globe, from 15:30 – 17:00 UTC-7.